There’s no better endorsement of a product than when it’s used by the president of the United States. When President Obama had his annual physical earlier this year, he was given a virtual colonoscopy on a CT scanner. The noninvasive procedure, the results of which were not made public, offers a high-tech solution to personal health-care needs. Carl and Judy Gerhardt recently underwent similar medical body scans in Clarkston. The reason: Judy’s family has a history of heart disease and cancer, and the couple figured it would be a good investment to find out whether their doctor could detect any risks. The Gerhardts, who live in Milford, had ARC scans of their regular heart arteries and their carotid arteries, which cost a little extra but gave them added reassurance. The couple understood that they would have to pay for the procedure out of their own pockets ($300 per scan) since, like most health-insurance policies, theirs doesn’t cover the service. But they saw it as a reasonable investment, considering the potential costs of suffering a problem they hadn’t anticipated. For Carl, 66, and Judy, 63, the scans showed nothing unusual. They will most likely wait another five years before they go through the procedure again. With clean reports in hand, the Gerhardts say they’ll continue to be careful — if not fanatical — about maintaining good health habits. And they won’t have to waste time and energy worrying unnecessarily. The risk of developing serious medical conditions led to the widespread appearance a decade ago of early warning or “body scan” centers. Using state-of-the-art scan equipment, the centers were established to take images of patients’ internal organs, in an effort to detect unusually high levels of calcium and other potential problems that might create a higher-than-normal risk. While the technology is no substitute for a traditional checkup, and its practitioners make no claim that it can uncover every conceivable problem, it does offer the ability to look inside the body and detect potential risks that more traditional measures can’t immediately spot. 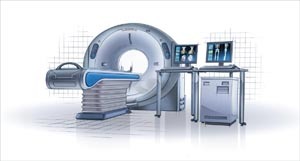 Associated Radiologists and other scan providers haven’t experienced the kind of market many were expecting when the technology first became viable in 2000. At that time, it was widely anticipated that health insurers would readily reimburse their subscribers for taking such a proactive measure intended to help prevent heart attacks. But the insurance companies decided otherwise. “They don’t want to pay for something that has potential mass use,” Kahn says. He’s frustrated by the insurance industry’s position, but he’s realistic about the likelihood of it changing anytime soon. That’s one reason why body scanning only accounts for about 10 percent of what Kahn’s practice does — and why many others who provided the service in metro Detroit have come and gone. Since then, Kahn says, the industry has faced the perception that the service must not be legitimate, because insurance companies won’t pay for it. Perhaps the best example of a come-and-go center was the Auburn Hills-based Early Warning Healthcare Institute, which opened in May 2002 under the direction of Dr. Donald Bronn. Using Electron Beam Tomography connected to superfast computers that analyzed imagery, Early Warning looked to provide crucial, potentially live-saving information to thousands who might otherwise have no idea of the risks they faced. Bronn, who now operates out of an office in Bloomfield Hills, says the closure of Early Warning was a bow to business reality — and also to his belief that body scanning may be rendered obsolete by the emerging practice of genetic profiling. When the Early Warning Healthcare Institute was operating, it performed CT scanning, virtual angiographies, and colonoscopies, although Bronn says they never really did general body scanning. A more sustainable economic model might be represented by another scanning center, Royal Oak-based Central Medical Imaging, which offers scans to the public but doesn’t have its own radiologists on staff. Instead, CMI contracts out the reading of the images to Beachwood, Ohio-based Franklin & Seidelmann, whose radiologists conduct the service, provided they’re licensed to practice in the state where the scan was performed. One of the most in-demand scanning services at Associated Radiologists is the heart scan, which checks the aorta for high concentrations of calcium and the resulting plaque. High concentrations of calcium and plaque can signal a heightened risk of heart attack, although it may not be imminent. And the people found to be at risk aren’t always the likeliest of suspects. The couple provided an example, Kahn says, of why cholesterol readings don’t tell the whole story for many people, and why not everyone should be shooting for the same numbers on the cholesterol scale. While it’s always good to maintain your LDL, or “bad” cholesterol, at the lowest level possible, a person with little or no plaque can handle a much higher level of LDL than a person with high plaque. Kahn wants people to know that the cost of a scan isn’t prohibitive. At Associated Radiologists, he says, patients are charged $300 for a heart scan. But in a society accustomed to the idea that health care that’s not covered by insurance is essentially unavailable, it’s hard to persuade people to pay out-of-pocket for a procedure that’s strictly preventive — no matter the potential impact of what might be found. That seems to be reflected in the demand Kahn is seeing for the service, where at least one person asks almost every day for a scan. He says Associated Radiologists recently offered the service free to Clarkston firefighters — a group Kahn says is in a high-risk category for heart disease because of the stressful nature of their jobs. Kahn sits down with everyone who has a scan and explains the meaning of the results. For those whose findings signal risk, he recommends that they see their regular doctors, show them the results, and discuss possible steps to prevent problems for which the individual may be at higher risk. Kahn says another benefit of doing a scan is to find out who isn’t at risk, so they don’t take medications they don’t need, with unnecessary costs and side-effects as part of the bargain. But persuading the public to spend money remains a challenge, even considering the potential costs for some of not doing so. While Kahn admits he’s glad he doesn’t have to deal with the insurance industry’s byzantine reimbursement process, he says that’s small consolation for anyone who might miss the evidence of a heightened risk for heart disease.